Human history demonstrates that where personal discipline is no longer expected, it is rarely practiced. It’s difficult to find a setting where is this more widely illustrated than on the campuses of American colleges and universities… especially amongst segments of the student population who are not interested in receiving an education. Athletes bent on professional sports, socialites clinging to indulgent experiences, and hard-partying participants in the Greek system were using college as a recreational exercise long before “Animal House” stopped being merely descriptive. That the focus of the ESPN reports points at the irresponsible and undisciplined behavior of athletes is ironic because athletics only exist in American school systems for the purpose of promoting the character development of the whole person. Let’s get this straight: athletics have absolutely nothing to do with academics. The American desire to produce high character and moral fiber in students, combined with the belief that sport produces discipline in the lives of young people is what connects athletics and schooling, not academics. The financial exploitation of student-athletes in the early 1900’s led to the creation of a governing body called the NCAA. Since then, intercollegiate sports have been governed by professional academics and athletic departments. For good or for ill, American colleges have been in the sports entertainment business since 1906. Most European colleges do not offer scholarships for “athletics”. On the “Old Continent”, sports are divorced from scholastic enterprises, leaving athletes the ability to play for clubs that pay them, and allowing those who desire knowledge to pay for an education. An English institution of higher learning doesn’t double as a minor league basketball program in the way that their American counterparts do. Which begs the question, do major NCAA college campuses demonstrate that, through sports, we are highly successful in instilling the values of discipline and self-control in students who do not posses them before they arrive? Are the coaches allowed to do something besides win? Does self-discipline and hard work go hand in hand with marijuana usage? They call it “smoking dope” for a reason don’t they? If you don’t believe that marijuana comes at a cost for athletes, ask yourself why so many college football stars go on to be professional football failures. Is it because they didn’t have the talent, the intelligence, or experience? Salaam admitted years ago that partying and marijuana contributed to his downfall as a player. Of course a great athlete can have a great athletic career after smoking marijuana through college. This is why I’m not saying that marijuana is the problem. Widespread marijuana use is merely the thermometer telling us how sick the patients are. We can point out that “a lot of people are sick” or that “they aren’t as sick as they could be”, but the truth is that a “successful career” in professional sports is only a fraction of the life that will be lived by only a minority of the athletes who enroll in college and fail to learn the self-discipline that sports are purported to teach. 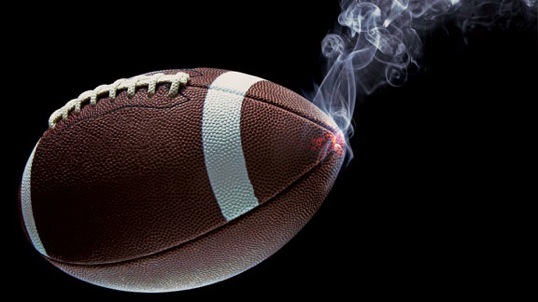 Do college sports have a pot problem, or do humans have a self-discipline problem? Maybe weed is just rubbing our face in it.